Disclaimer: Pencyl is third party software we've bundled into Stencyl. 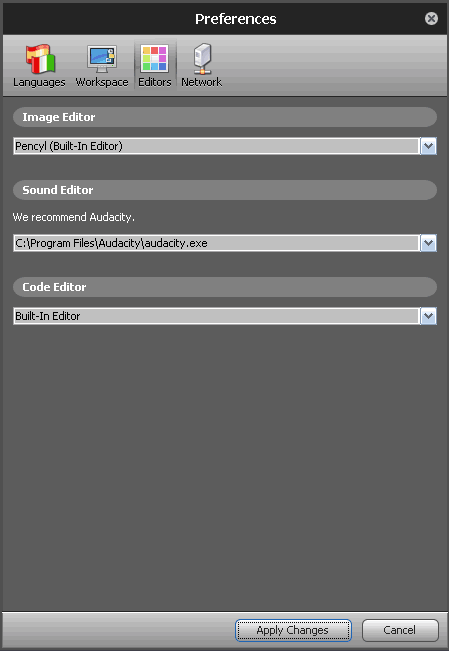 It is a rebadge of a free, cross-platform editor that is closed-source. As such, we are unable to support or develop it. You are highly encouraged to use another package of your choosing such as GIMP or Photoshop. 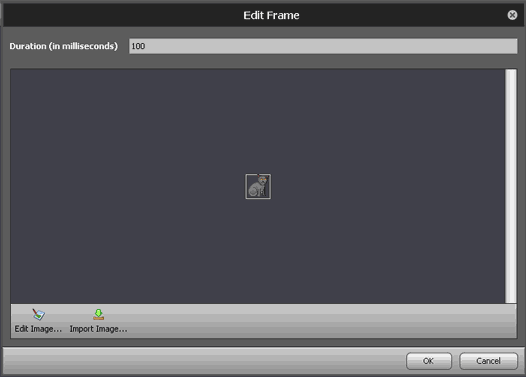 Pencyl is Stencyl's built-in image editor. You can access it through Stencyl any time you need to edit an image on the fly. Don't like Pencyl? Try out these other free image editors. Pencyl is the standard option for the image editor when you install Stencyl. You can change it to a different program (such as Photoshop), or change it back to Pencyl, by opening up the Preferences menu from the File dropdown menu. Once you enter Pencyl, you will see the toolbar, which may be familiar to you if you have used any kind of image editing program before. This is the Transform Selection Tool (V). It changes the position, height and width properties of the image. This is the Rectangle Selection Tool. With the right mouse button, you can drag and select objects on the screen. This is the Ellipse Selection Tool. It works just like the Rectangle Selection Tool, except circular. This is the Lasso Selection Tool (L). It allows you to draw any shape and selects anything in that shape. The Dropper Tool (I) allows you to pick any color you click on for the Foreground color. The Magic Wand Selection Tool (W) selects an object by color. Tolerance increases the selection. The Fill Tool (F) fills an area with the Foreground color. Tolerance increases the size of the affected area. The Pencil Tool is used to draw pixels with the Foreground color. Great for sprite work. The Brush Tool allows a creator to draw in different styles and automatically uses Anti-Aliasing. This is the Clone Tool. It clones an area by allowing you to select an area you want to clone from. The Eraser Tool removes what's on the canvas. This is the Line Tool. It creates lines. This is another Line Tool. This one has the option of creating arrow heads at the end of a line. The Rectangle Tool creates rectangles with the added options of the Rectangle Selection Tool. The Rounded Rectangle Tool works just like the Rectangle Tool with added Radius for the corners. The Circle Tool creates circles. The Star Tool can be used to create stars for a night sky, or anything else star-shaped. The "A" symbol is the Text Tool. It has quite a few font styles to choose from. Gradient Tool. This tool allows you to make gradients. The Perspective Transform Tool allows you to shape the image into a perspective by manipulating the corners. The Warp Tool warps the image as you push around the bright green grid nodes. The Panning Tool moves the screen around. This does not affect the position of the image. The Zoom Tool zooms into the image, like the Panning Tool, it does not affect the image. This shows the Foreground and Background colors you're currently working with. The small arrows on the top-right corner switches the colors assigned to the right mouse button. The white and black boxes in the bottom left corner are the default colors. By clicking on them, the Foreground and Background become black and white, respectively. On the left-hand side of the program you will see another vertical bar that lets you manipulate colors, gradients, and opacity. Each section on this bar has its own options for fine-tuning an image. When you're done, you can save your image in a variety of formats. Of these, we recommend sticking with PNG. Native No Saves under the extention .ie which can't be opened by most programsm if not all. Don't use this one. JPEG Yes Does not support transparency. PNG Yes The best for transparency and arguably the best format for sprite work. PSD Yes No transparency, and the layers don't seem to carry over to Photoshop or Pencyl. Targa No Does not open in Stencyl. Sun Raster No Does not open in Stencyl. PCX No Does not open in Stencyl. ImageIO: jpg/jpeg and png Yes Saves with transparency, but jpg and jpeg seem to have horrible quality. ImageIO: gif Yes Still no transparency for you. You may only Undo an action once. Images cannot exceed 2048 x 2048 in size. Somehow I can't get Pencyl to install. I have no idea why. I'd like to add that Paint.NET is a small, simple use image editor that allows for a plethora of extensions and add-ons. Also, perhaps because I'm using a different version, but the executable .JAR file "Pencyl" is now nowhere to be found. I can still access Pencyl through clicking "Edit Image" in Stencl itself, but I was hoping to shortcut it to my desktop for when I wanted to edit on the fly. Please update location? When CorelPhotopaint x64 opens it has the image, but where should I save it then? I'll probably have no response, but I downloaded Pencyl and when I click "edit frame" or "edit frame (external)" absolutely nothing happens. I'm at a loss. It is set as my default editor. Love your sharing! This APP is really nice, but I think you can use a more professional editing tool. This is website about Discount and Promo Codes for Photo Editor Software. I guess you may be interested in it. I'm having the same problem as Ramorez117. Pencyl will not load in Ubuntu. I click the pencyl icon and it opens a folder with two more folders inside, neither of which opens Pencyl.